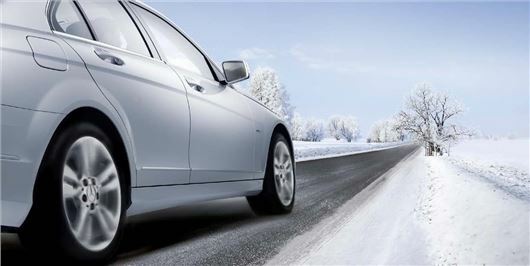 Mercedes-Benz has confirmed that its retailers are stocking approved ‘MO’ winter tyres. The manufacturer has worked with a number of the major tyre suppliers – Bridgestone, Continental, Dunlop, Michelin, Pirelli – to improve tyre performance and ride comfort. All cold weather tyres sold by Mercedes-Benz retailers will be Mercedes Original and feature the ‘MO’ logo on the sidewall to denote the tyres have been approved for use. Winter tyre and wheel packages start at £950.00 (including VAT) and the approved scheme will ensure compatibility with each car in question. Effective as soon as the temperature falls below seven degrees Celsius, winter tyres feature a better rubber compound, which remain supple at low temperatures to provide better grip and handling on wet, icy and snow-covered roads. The tyres also have wide grooves, which provide extra grip when accelerating and braking, reducing the chances of skidding. Mercedes-Benz claims its approved winter tyres can improve braking distances by up to 50 per cent on snow-covered roads and by four metres on wet and cold roads. They are also 20 per cent more durable than standard warm weather tyres at low temperatures. Interesting - I think we'd need to see a side by side comparison of the MO tyres, Continental Tyres & Michelin Winter Tyres though... just to see if they're any good.